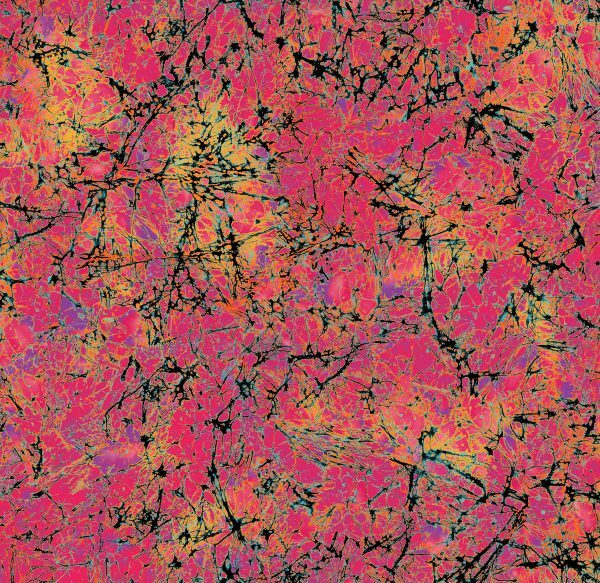 ChromaZone, Paula Nadelstern’s 14th fabric collection for Benartex, will premiere at International Quilt Market in Houston this year. Benartex will give away one set of half yard cuts of the entire ChromaZone fabric line. Read more in this post. Companies like Benartex who design and print our quilt fabrics are called converters, because they convert greige goods into the prints we buy in the quilt stores. Greige goods (pronounced gray) are raw fabrics before they undergo dying or bleaching. I don’t have an art or textile design background. My degrees are in Occupational Therapy with a Masters in Psych, although I haven’t worked in the field for a very long time. Until my accidental apprenticeship with knowledgeable Benartex designers, everything I knew about color I learned as a kid from my prized box of sixty-four kid-worthy crayons. I work with the Benartex Creative Director and Stylist, Ruth Beck, and a clever, creative CAD artist who gets me. They help take my “What If” ideas all the way to the quilt shop. Ruth is responsible for marrying trend with design, color and technique. Equally important, she has production know-how and understands the nitty gritty of how to print on cloth (which is very different from paint or CAD processes) and how to communicate effectively with the Korean mill. Keep in mind, I’m not only a fabric designer, I’m also an art quilter who uses fabric with luminosity and shading in her series of kaleidoscopic quilts, and I’m a teacher whose students’ success often relies on fabrics that mirror image. When I set out to design a new collection, I’m balancing these three aesthetics. My goal is to design beautiful stuff that can be used in a myriad of ways for anyone’s piecing adventure, not just to be used to make kaleidoscopic designs. I welcome color and motif inspiration whenever I’m lucky enough to notice it: an elevator door, a set of Italian dishes, a painting at the Met, the arabesque patterns in the Sheikh Zayed Grand Mosque on a teaching trip to Abu Dhabi. From the start, ChromaZone was to be about color. Lots of it. The title was the product of a brainstorming session fueled by a lovely Sangria in Casa Hidalgo, a fish restaurant in Sitges, Spain where me and my three best quilting friends were exhibiting our Semper Tedium quilts—but that’s another story. It was also intended to be a relatively small group taking less time than usual because of my extensive 2014 travel schedule. With this in mind, I began by making mock-ups using artwork from previous collections. Since I don’t create on the computer, I physically cut and collaged actual fabric. The CAD artist scanned these and then skillfully used Photo Shop to move them toward a finished product. I sit at a computer a few feet from her so we can collaborate easily. Months later, an existing design called Dragon Feathers turned into Dragon Medallions, Magmatude evolved from Magma, and I re-colored a previous allover called Sunstone to work with the new group. Vox is brand-new artwork, taking on the role of a great ombré stripe which automatically slides the eye from here to there, forming visual pathways that instill an element of motion. We had ambitiously over-designed the previous collection, Fabracadabra, which turned into a collection too big for marketing purposes. The leftover, Filigree, was adapted for ChromaZone. 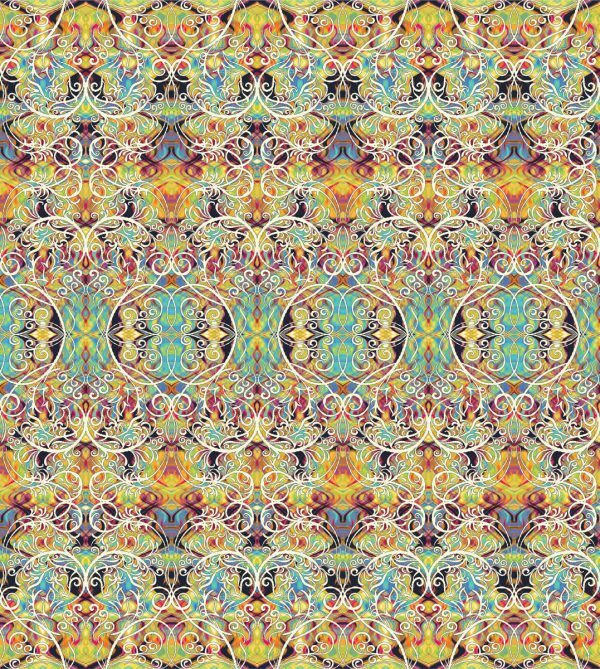 I color the line on a computer in the Benartex studio using textile design software called Evolution. As I’m coloring, I’m fascinated by the idea that I can cause different color ways of the same design to function in diverse ways. In one colorway, a contrasting motif might pop and create a visual line when it connects to its repeats. 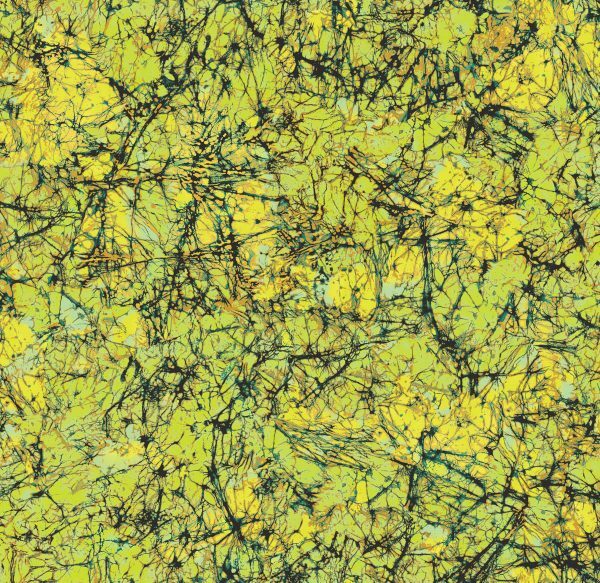 In another, the same motif may be colored in a hue that softens it so it recedes (rather than pops) or connects it to a neighboring motif (rather than standing out on its own). Some of this is serendipity, some contrived by me but ultimately it means I have a bigger “vocabulary” to work with. You can see what I mean by looking at the four colorways of Magmatude. 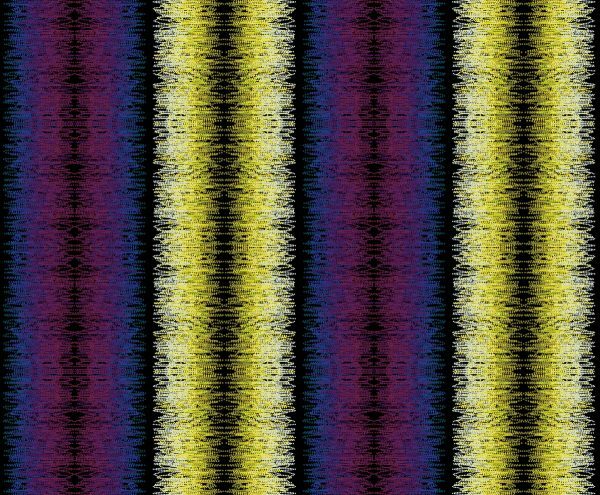 ChromaZone has five patterns in four colorways. I always do a Blue group (because I know it will be the most popular) and I always include a Multi filled with lots of different colors. The new direction this time is a Christmas color story, as true to the iconic colorway as I am capable of since I’m programmed to believe that when it comes to color, more is more. The Caribbean group was inspired by a teaching cruise to the Bahamas. This collection has a more painterly quality than usual. In previous collections, most of the designs have a precise quality with clear definitions of the motifs because each element is outlined. The outline keeps each color contained in its position. Without an outline, a painterly effect is created because one color might fall-on another producing a third color. This is called trapping. Fall-ons are less apparent when it’s a fabric with a single color story, like shades of yellows. The role of the outline is to separate colors that don’t make good neighbors, like orange and green which can generate an unwanted muddy brown where they touch each other. The painterly approach made a difficult job even harder for the stylist whose job is to make sure that what I create on paper can be produced on fabric. A good example of both of these effects can be seen in the pattern called Filigree. The colorful, painterly pattern in the background is not outlined while the prominent white scroll is outlined in black so the white stays fixed. It takes a long time, at least 6-9 months, from the day the three of us meet to discuss the new line to the day it is sent to the Korean mill for the first strike-offs. A strike-off is a test length of fabric printed by the mill in order to check the pattern registration and colors. From strike-offs to actual fabric is about three months. I live in the Bronx (which is the most northern borough of New York City) and typically commute downtown to Benartex by subway for at least 3 months almost full time, broken up by teaching commitments. I don’t do any of the coloring at home because I don’t have the computer software or large format printers. We have a give-away of one set of half yard cuts of the entire ChromaZone fabric line. Simply comment on the post to answer the following question: How would you incorporate ChromaZone in your next project? A winner will be drawn randomly on October 26. Good luck! Congratulations to our WeAllSew fan gloria! Enjoy your new fabric! I LOVE this new color line ChromaZone! I would use the Caribbean group to make a new quilt for our guest bed. Thank you for the information above. Quite interesting. oh gosh, what project of mine couldn’t make grand use of these beauties, I myself?! Landscapes, pinwheels, backgrounds, collage to kaleidoscopes! But my first choice would be to use that crackled effect. Beautiful! Fascinating process – wow. I have always been partial to Paula’s choice of colors and amazing designs. These new fabrics would work well for a stunning quilt for my bed, as well as a super wall-hanging as an accent! Wow, those are sure pretty! I would use the material to make some really stunning handkerchiefs! Congratulations on the new line- it’s really interesting! I’m looking forward to seeing how it inspires others. Great work Paula & Benartex! These are absolutely breathtaking! Quite honestly, I’m not sure how I would use them, as I would need to lay them out and play with them (fondle them, as my husband says). 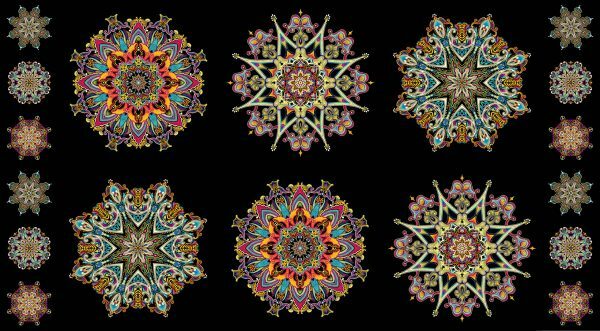 I’m leaning toward kaleidoscopes, probably in an art quilt, but they may tell me they want to be something entirely different! I would like to use Filigree Red and Green with Sun Stone Fuschia to make a set of quilted placemats. The would be outstanding. Thank-you so mush for the new collection. Wow! That is beautiful! I’m not sure how I would use it yet, probably look at it for a long time until inspiration struck. I would love to use the Christmas motorway in a new Christmas quilt design. Paula this new fabric line is exquisit. I enjoy creating kaleidoscope quilts as wall hangings. I love the colorways… I think I will need all of the colors… and I want to use some in a quilt and in a purse/bag and in a vest perhaps…. Wow, those are all beautiful. I would like to take many of the prints, and surround them with a lot of solids, to make them really pop! This beyond gorgeous. I am making a La Passacaglia quilt. These fabrics are perfect for this quilt’s fussy cutting. I would use this collection by fussy cutting the Christmas Filligree and the Kaleidoscopes for a quilted Bolero and party dress for our 2 1/2 year old Grand-daughter for the Holiday season and on into the Spring with lace petticoat and Bolero Cuffs. How would I incorporate it in my next project? I would put it in my suitcase when I take Paula’s Kaleidoscope workshop in the Spring, of course!! (If there’s any left in the stash by then!!) Dazzling & Brilliant, can’t wait to play! I’m thinking main focal point surrounded by fussy cut Dresden plates with Persian toppers. I would use the Chromazone fabrics in a rectangular wall quilt to focus visitors’ and family’s eyes on the refreshing colors which draw us to the wall and reveal strong emotions. Inspiring, as I would expect. This is the perfect base for a mixed-media ornament I am producing! Thanks for all the behind the scenes information. Civilians have no idea how much work goes into fabric design and creation. This collection would be great for simple piecing as the fabric could do most of the work. English paper piecing! I am currently making a quilt using mostly Paula’s fabric. Can’t wait to add this new collection!!! Paula, this is an absolutely beautiful line, with outstanding colors and designs!! I would love to use it in making kaleidoscopes (of course! ), and also a southwestern-style quilt I have in mind, and a wedding-ring-like-no-other for my nephew and his wife. 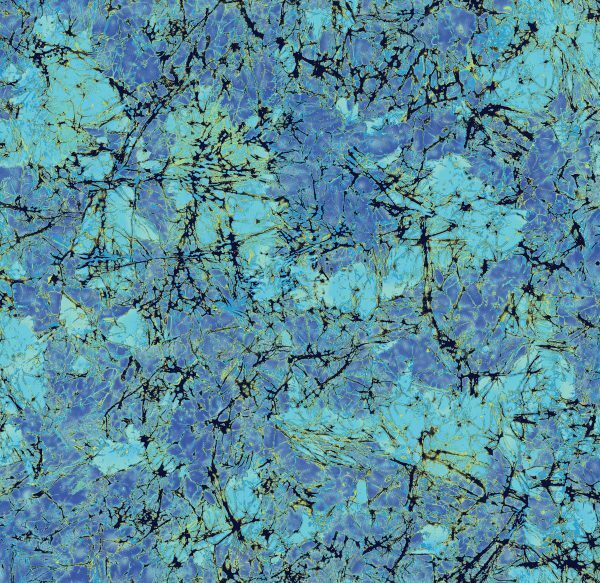 I would love to use the Blue shade of Magmatude as the focus fabric in a new quilt. Thanks for offering the give-away. I would love to make ChromeZone into a throw quilt. I love the colors, and the kaleidoscope effects. I would use your fabric to make one of your fabulous quilt designs. Thanks for the opportunity to win. I’m in the middle of a Lucy Boston Patchwork of the Cross and I think this fabric would make a great PoC quilt. These are beautiful works of vibrancy. I would sew simple panels to cover French Door glass panels, rotating the panel designs to complement what the eye sees beyond the panels with the changing seasons. Both functional and a work of art! These would be a wonderful addition to my Millifiore fabric selection. 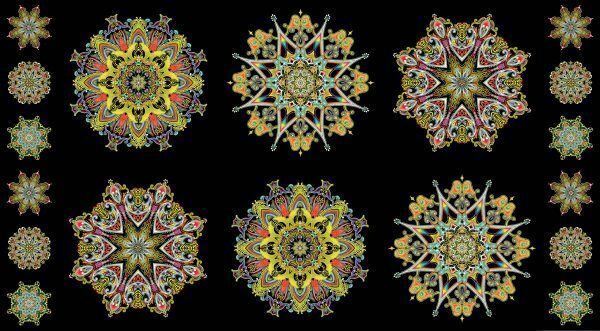 I love fussy cutting the patterns into kaleidoscopes. Having seen the Strikeoffs, with Paula, I can attest to the beauty of the collection. Many of my sewing/quilting projects use little pieces of Paula Fabric over many years. Beautiful fabric. I would love to use them in a QuiltWorX quilt. I’ve always loved Paula’s fabrics and these are spectacular. I do small wall quilts combining fabrics and beads. Paula’s ChromaZone line is the perfect addition to the kind of dense, patterned, and shimmering textiles that I use. I love making hexagons & would like to use this new fabric to create some unusual looks. Another great line Paula. I see a spiral based quilt design lurking in there! It would be hard to make the first cut in this fabric! But then… definitely something fussy cut. Great collection! I’ll be using these bright fabulous colors in my quilts! Paula Nadelstern is my favorite designer full stop. I will be using this new collection to make Simple Symmetry quilts using Paula’s method. All my friends love it and want me to make one for them ? I put a bit of Paula’s fabric in all my quilts. The ChromaZone fabric line is stunningly beautiful! I want to just frame a piece of it in a border and that would make a beautiful quilt. Thanks! I would love to see tote bags from this line. It is awesome. I think I would make something reminiscent of stained glass windows. These colors just pop! I know I would have trouble cutting into them for a little while. I love this fabric! I do a lot of EPP and have millefiori quilts on my list to do, and these would work so well. Oh, These fabrics will be perfect for fussy cutting in my La Passacaglia quilt!! WOOZA! I would love to use some of these awesome fabrics in a Mariners Compass quilt! With a background in math and a love for drafting original designs, often circular ones, with access to these fabrics, I could have endless “playtime” in my studio, “fussy” cutting in just the right spots to create my own versions of mandalas. I’ve admired Paula Nadelstern’s work for a long time and recently I nearly fell over when I answered the phone and it was Paula, calling to tell me she would like permission to use an idea from one of my quilts! Totally made my day!! Of course, I said, YES! I love all your fabric Paula and this new line looks terrific. Beautiful colors. I would make an art quilt made with this ChromaZone fabric cut in unique shapes. Thank you for all the information about how your fabric was created. I love the Christmas colorway. It reminds me of old-fashioned tree ornaments. I can imagine making beautiful tablerunners or a tree skirt using this fabric. Love it! I can’t say which color way is my favorite! 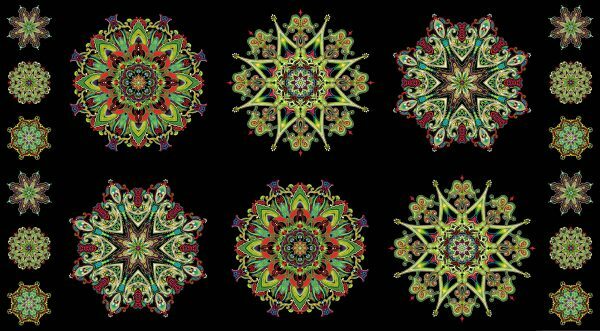 I would probably use the multi for the beautiful ornaments I saw in class, and some of the others for the larger version of simple symmetry. Or I would add it to my collection and admire it. Swoon! Chromazone is amazingly beautiful! I love the colors and intricacy. This is one of the most exciting fabric lines I have seen in a long time. I would use this to make a kaleidoscope quilt, and then the scraps would find their way into small art quilt projects. Thanks for the chance to win, and thanks for the great post too – fascinating information about the process. I would add all the fabrics to my ongoing La Passacaglia quilt..I am only using Paula,s fabrics in my quilt as the main focus fabrics..EPP it sure takes time but looks great with earlier fabric lines. I love all of Paula’s work, and just finished my first Paula-inspired kaleidoscope quilt this year. I am looking forward to added some of these new fabrics to my stash for my next project. They are GORGEOUS! I would use it to make a beautiful quilt. I make unique fabric baskets and am always searching for colorful quality fabrics – these would be perfect! WOW can’t wait to get some of these. They’re reminiscent of when I used to make Fractal art. LOVE IT LOVE IT LOVE IT!!!! I’m thinking that I would use this wonderful fabric in my next Victorian Crazy quilt. Beautiful fabric! What a beautiful line of fabric. I’m a mixed-media artist and a quilter so I envision many, many use. My next quilt will be a large wall hanging, a fabric manipulation sampler. I would love to see how the Vox (ombré) design would appear differently in each block. It could be interesting to alternate those blocks with kaleidoscopic images pieced with the filigree fabric. Lovely collection, and yes, my favorite is the blue! Hi I’d love to make a new Modern Quilt with these ! I would use the fabric to make my Spirit Art Dolls. Incredible fabric ! I think I try using it as a single framed kaleidoscope block for a pillow top. LOVE the new fabric!! I would love to incorporate them into a quilt to warm up my recently painted bedroom. Art quilt nirvana. So much I could do! There’s so much I could do with this fabulously gorgeous fabric. My favorite would a Christmas table runner. But the options are endless. OMG, yes! I would definitely use the Carribean Group as a Christmas tree skirt. The colors absolutely GRABBED me and made my brain smile ;} I love, Love, LOVE these! Wow! Fantastic line! I would use it or fussy cutting and backing! It would be hard to cut this beautiful fabric but a quilt would be great! Just love this new fabric! Can’t wait to see it at the fabric shops. 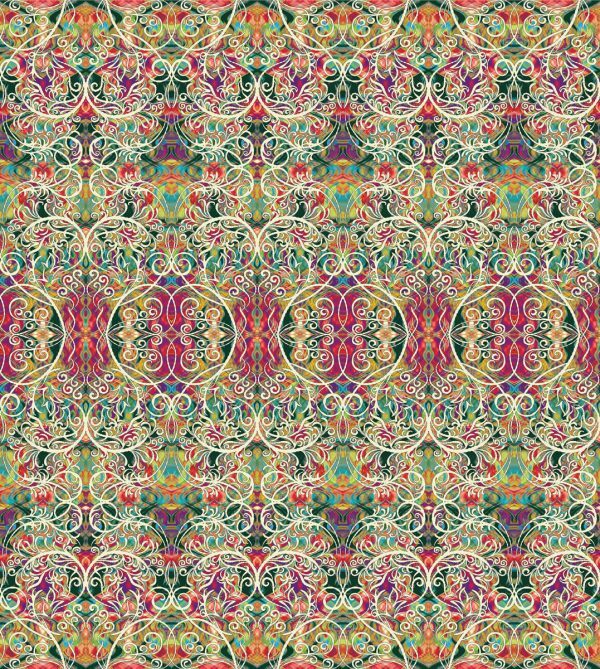 Will use this to do kaleidoscopes, sixty thirty & simple symmetry that Paula teaches. The fabric line is beautiful! I would use it in a Mariners compass quilt for my daughter. Loved the post, I enjoyed learning about what went into creating the fabric line. I could see madallions made from this fabric, then into a quilt. I love all your fabric lines…but with this new line I would be fussy cutting for a hexagon quilt. What a quilt that would be! I would make a kaleidoscope quilt–any left overs would be cut into triangles or tumblers or hexagons for a wallhanging or table mat. I’m a quilter, so naturally this beautiful fabric would become a quilt of some sort. I’m thinking maybe some sort of a stained glass wall-hanging to begin with and then, who knows? So much beauty to inspire me. I love all the colors of this fabric. I would like to use it to make a quilt depicting cats. This line has so much inspiration. I would love to create a Millefiori quilt with it, but then it is saying use me for large hexagons. Beautiful thank you for sharing. I would definitely do some fussy cutting for whatever I would make with these. So gorgeous! Lovely design and color. The designs look like they allow a lot of versatility to use the I in my art quilts. I look forward to including them in my fabric color palette. I love the name of your fabric collection… It is perfect!!! I’d love to make a quilt!! I would use the kaleidoscope fabrics as fussy cut blocks and border them and the quilt with the other wonderfully rich designs in this line. I think it would make a stunning quilt. Congratulations on this beautiful new collection! Thanks for sharing the design process with us. Fascinating! awesome fabric. I would make Christmas dresses for my 2 granddaughters. What beautiful fabric! I’d do a lot of fussy cutting to use! This fabric line is fabulous and so exotic! I would use it with some coordinating solids to make new pillow covers for my guest room. If any fabric is left, it would be made into a bed runner. I love it! I would use these gorgeous fabrics in a stained glass format and make a wall hanging. Thank you for the opportunity to win! What gorgeous fabrics! I’d make a scrappy feathered star with this collection. Thanks for the chance to win. I would make some awesome Supernova blocks! Thanks for the give-a-way! My artistic daughter in law has been asking me to make her an art quilt. With these fabrics we can design a beautiful wall hanging. Such great information, I love learning the process of what it takes to get the fabric I pet and buy. These fabrics are beautiful! I would use the Filagree pattern as a border in a quilt and the stripe would make a beautiful binding. I loved the covered foam balls and made several with the Patternista collection. Would love to make more with this new collection, but I also see the Chromazone pieces in a fantastic quilt border, they would miter spectacularly. I’ve been following Paula for years. I have a print of one of her quilts hanging in a prominent place in my living room. So if I win this I will definitely try my hand on a kiladascope quilt. I absolutely love the blue colorway but since Christmas is so close, I think the red would be perfect for a table runner. Actually, love them all. I love all the colorways. I think the Carribean group would be great for a quilt for my BF who just moved to Florida. beautiful design by Paula Nadelstern. I would make a bed runner and add some blocks to my headboard to coordinate. I have been dying to make a kaleidoscope quilt and have all of Paula’s books! I would definitely use her fabric to create a quilt. This new line is absolutely gorgeous! I would combine with Jane Sassaman stitching techniques to do a Libby Lehman circle quilt. Indeed a salute to all my favorite artists. Thank you for making the commitment to complete these designs. Can’t wait to see in stores but would be LOVELY to have my name drawn!! I love it all! I’ve worked with Paula’s collections for a long time. 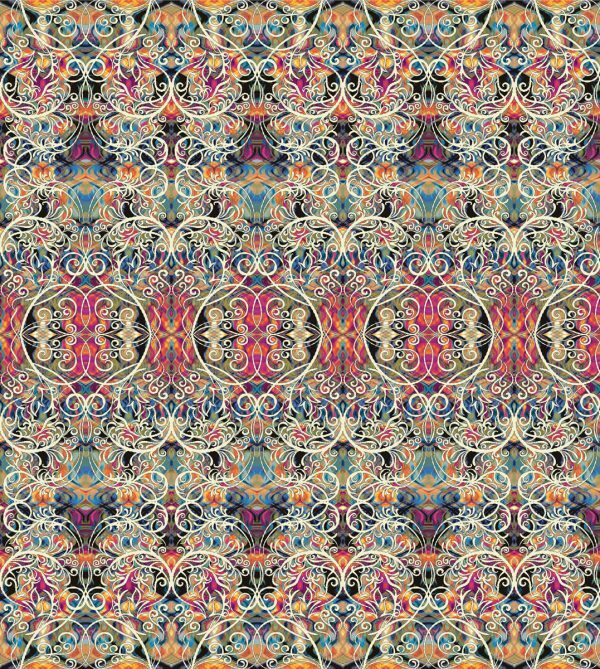 They make the most incredible kaleidoscopic designs!! Somehow, even if there are scraps left over, they always work with scraps from previous PN projects so I never seem to quite run out of fabric… But I always need more! These are the most amazing collections of fabric I’ve ever seen! 😆 😆 😆 😆 I love all the colours and I’m not sure which one I love best. 😮 BUT if I had to choose….just 1….it would be Caribbean group. It’s so colourful and I can imagine myself making a beautiful kaleidoscope quilt with this one. Close 2nd is the Blue colorway. 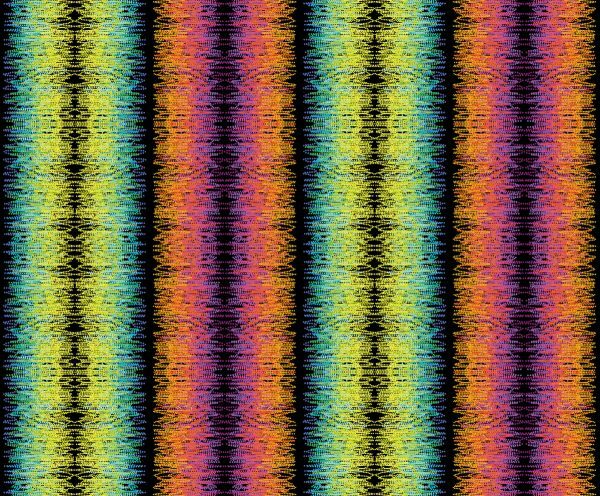 I love the colors in ChromaZone and would use them in a quilt design I would create to emphasize their beauty and lines. Never fear, all of the fabrics would be used somewhere. I envy your chance to do the designing. I would attempt to make a kaleidoscope wall quilt. Beautiful line of fabrics. I am working on an interesting new art project that I am sure this fabric could be a wonderful part. I am looking forward to this line becoming available in my LQS. Thank you for an enlightening article. The ChromeaZone Blues absolutey “sings” to me and now that I am about to acquire a new scooter (blue in color) I am longing to make myself a jacket to match using this fabulous fabric.